News: Chinese architect Ma Yansong has revealed plans for a mixed-use complex in Beijing featuring skyscrapers, office blocks and public spaces modelled on mountains, hills and lakes. Yansong, who leads Beijing studio MAD, designed the urban development for a site on the edge of Chaoyang Park, one of the largest city parks in the world. Rather than creating an obstacle between the city and the green space, the architect wanted to design buildings that bring the two districts together. "By taking the natural beauty of lakes and mountains, the architectural complex can be read as a futuristic city landscape painting," explained the designers. "High-rise buildings act as the peaks, individual office buildings as the slope, high-end offices as the ridge and residential buildings as mountain ranges, in combination with classical landscape elements like lakes, springs, forest, streams, valleys, rocks and peaks." The design is based on Yansong's ongoing Shan-Shui City concept - an urban strategy based on a style of Chinese landscape painting and named after the Chinese words for mountains and water. "The whole architectural complex does not look like it is 'built', but growing up naturally from its surrounding environment and recreating a new Shan-Shui space typology," added the studio. MAD presented the Shan-Shui City concept in an exhibition at the WUHAO store in Beijing at the start of the summer. The studio has also recently released proposals for an art museum set in caves on an artificial island, as well as a village of towering apartment blocks beside the Huangshan Mountains. At 6pm New York time, September 5th of 2013, a green building with distinct Oriental features designed by Ma Yansong was launched at Times Square in New York city. 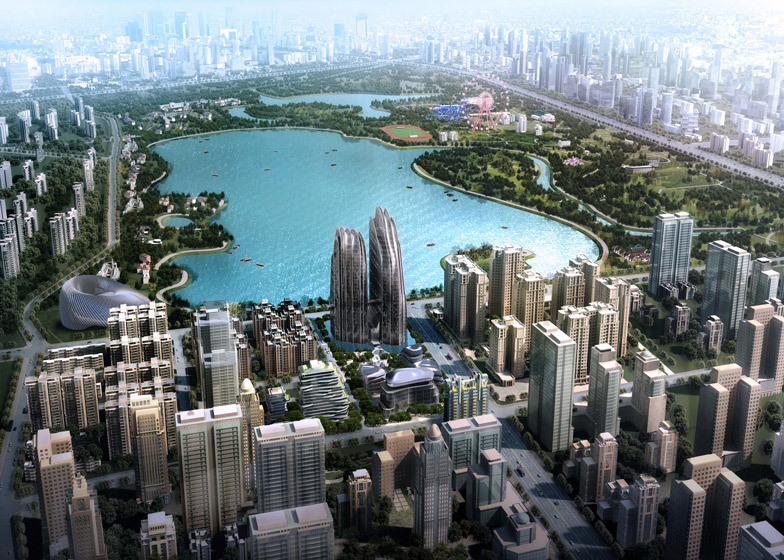 Located along the lake of Beijing Chaoyang Park, this city complex is the continuation "Shan-Shui City" – a design concept Ma Yansong has been pursuing. It is a new interpretation of China's ancient natural philosophy in contemporary city. In this typical CBD area that is flooded with extreme-modernism buildings, Ma Yansong aims at infusing the vigorous Shan-Shui culture into the new urbanisation with this "Chao Yang Park" project. Since this project is adjacent to the world's second-largest city park, Ma Yansong hopes that it will not become the boundary that separates the park and the city. On the contrary, by introducing the Shan-shui elements into the design, the building and the park is to be merged into a whole landscape, so to have the nature extending into the city, and to create a land of idyllic beauty in the city. The design starts with the understanding that the park is part of the plot: by taking the natural beauty of lakes and mountains, the architectural complex can be read as a futuristic city landscape painting in which high-rise buildings act as the peaks, individual office buildings as the slope, high-end offices as the ridge and residential buildings as mountain ranges in combination with classical landscape elements like lakes, springs, forest, streams, valleys, rocks and peaks. As a result, the whole architectural complex does not look like they are "built" but growing up naturally from its surrounding environment and they recreate a new Shan-Shui space typology. People can feel both the grandeur of the holistic landscape and its exquisite inside scenery. This project is an ecological complex mainly functions as offices and residential buildings. However, it goes beyond the usual concept of green building. It is a Chinese-featured green building developed with the "spirit of green". What Ma Yansong concerns a lot about is to seek the new direction of contemporary architecture and city from the traditional culture. This also decides if Chinese architecture can find its own way for future urban development. The simulation of the landscape of an international metropolis should take over the traditional Shan-Shui spirit and restore the natural traditional values followed with the innovation of architectural forms and the transformation of urban structures. In conformity with this idea, Ma Yansong will proceed with his exploration and practice of Shan-Shui City.